Hi friends! I hope you had a great day! I was running around a lot today trying to get everything done for my super fun weekend. I was cleaning, cooking, and doing errands and I managed to throw my back out. :( Hopefully, I'll be better tomorrow! Here's a card I made for Brady's friend Zachary's birthday. They are SO cute! They play together all the time at school and Brady just loves his friend! Brady told me that Zachary loves animals so I made this card for him. Card Positioning Systems 236 for this card but I'm too late to enter it in. Busy couple days! 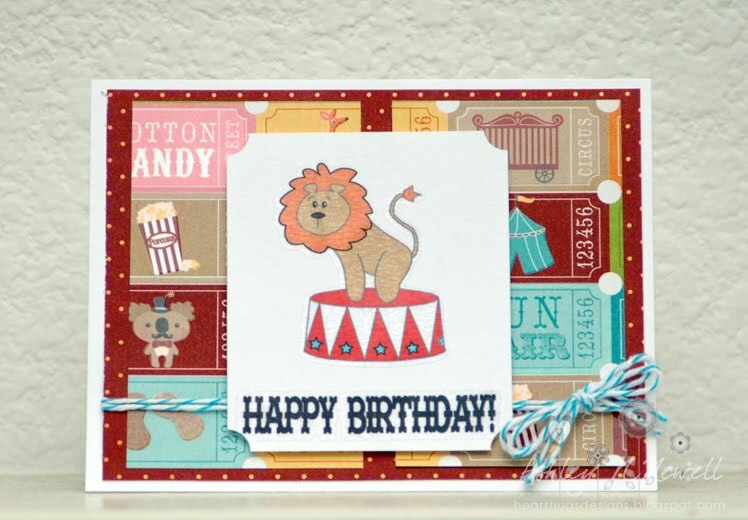 The main image and sentiment are from EAD Designs Carnival Fun. The paper is Imaginsce and the twine is Aqua Divine Twine. Is that paper from Imaginisce new? Mattie's first Bday party was circus-themed so I'm always on the look-out. Your card is so very cute! I'm sure Z will love it! cauuuuute! 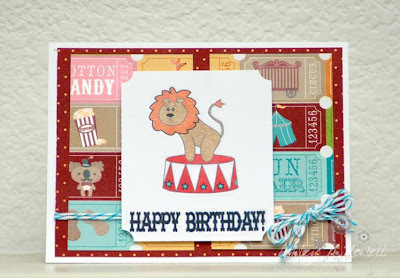 I really like that Imaginisce paper, and the clipped corners (on your sentiment paper). I bet Zachary and his Mom loved this card! Look at your spiffy new blog! Love it! And this card - shut the front door. That is over-the-moon cute! Zachary will be thrilled! This card is so freakin' cute!